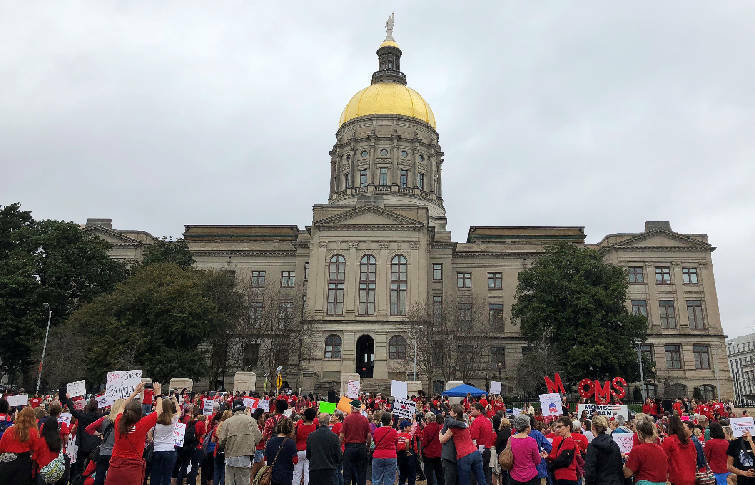 ATLANTA — Last week, hundreds of gun control advocates rallied outside the Georgia Capitol, calling for new laws to help put an end to mass shootings. Students staged "die-ins," mothers confronted lawmakers and activists pledged to vote out any lawmakers who do not enact "sensible" reform. The annual rally had added relevance as it took place a week after the Feb. 14 shooting at a high school in Parkland, Fla., that killed 17 people. Here is a look at some of the numerous gun bills that are up for consideration this legislative session in one of the most gun-friendly states in the nation. Nationwide, people who have been involuntarily committed for mental health treatment are added to an FBI database used during background checks by gun sellers to prevent the mentally ill from purchasing guns. Georgia state law currently mandates those names be removed from the rolls after five years, but some lawmakers want to end the mandatory "purge" and keep the records accessible. The proposal passed the Senate last year by a near-unanimous vote, but it still awaits House input. An attorney for Georgia Carry.org told The Atlanta Journal-Constitution the advocacy group is "OK" with the measure. One of the primary pieces of legislation backed by the "Moms Demand Action" activists last week was a proposal to force those convicted of domestic abuse misdemeanors to give up their guns. The measure was introduced by a House Republican last year — but has not received much movement since. Proponents say a large percentage of mass shootings are carried out by domestic abusers. A similar proposal was introduced in the Senate last week. It may face long odds of becoming law in the GOP-controlled legislature, but Georgia Democrats want to ban the sale and possession of assault rifles, large capacity magazines and some types of ammunition. The proposal would outlaw several rifles, including types of AR-15s, as well as certain types of ammunition, including armor-piercing rounds. AR-15 style assault rifles have been used in some of the deadliest mass shootings in modern U.S. history, including in Las Vegas; Newtown, Conn.; and San Bernardino, Calif. The bill would make possession of an assault weapon a misdemeanor in Georgia. A bill with bipartisan sponsorship would outlaw the possession of bump stocks, which can make semiautomatic weapons fire like fully automatic ones. Bump stocks gained national headlines following the death of 58 people during a mass shooting in Las Vegas in October. Authorities say the gunman used a rifle equipped with a bump stock in the slayings.